Here we go. It’s spring in the northeast and today it will be 55 degrees Fahrenheit. My son will have baseball practice outside in the school parking lot with the 10’ snowbanks as the homerun fence. Still, we are cautiously optimistic that it won’t snow any more here, but we all know it can happen right up until June 1st. The lakes still have plenty of ice and there are still several feet of snow in the woods of the Adirondacks just 20 miles north. I will hope to get a little more ski flying in before I leave for Sun ‘n Fun. Since we last blogged here, I completed the right wing and I was able to cut the build time in half compared to the left. Reading the manual and taking my sweet time on the left wing, I was right at 180 hours. Yup, that sounds high to me too when I say it out loud, but I cut that to 90 on the second wing so let’s just average them shall we? I will caution you that just because you did one and got through it unscathed does not necessarily mean that wing-2 will go that way. I was troubled in a couple of instances on the 2nd wing and, while no harm was done, it was frustrating. On the last rib there is a support strip that goes on the BOTTOM of the spar and machined rib… I put it on the top. I learned that lesson now two times so I made a notation in the manual so others will benefit from my mistake. It has been a great experience and with 2 wings done and ready for cover, there is an air of confidence, “its gonna fly”. 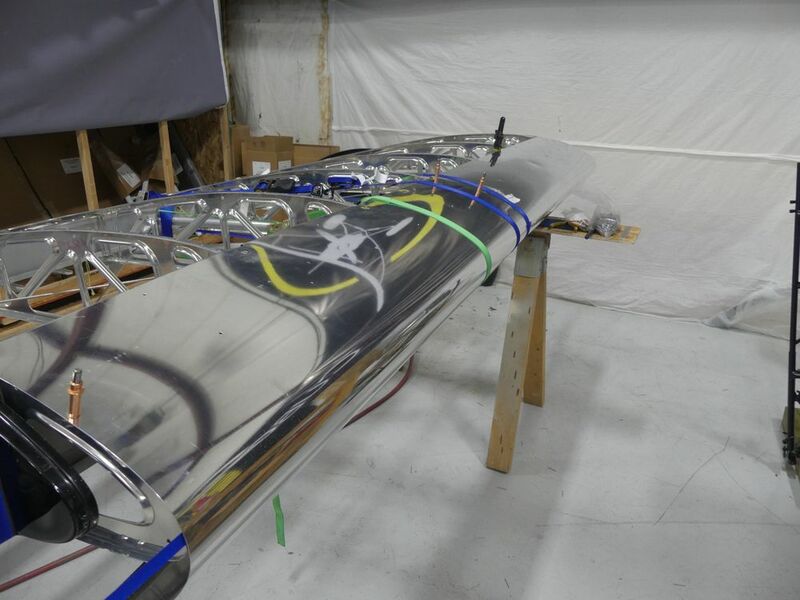 I have been working now on the fuselage for a week or so now and my pace has moderated. It’s the first time through these steps and I want it to come out nice. I am sorting through steps that seem counterintuitive initially but make sense after looking ahead in the manual. I want to suggest again that you read through the manual before you start your project. Honestly, I did not do that. I followed builders here and there on the forum but like most, I suppose, opened the box, did the inventory and hit it. 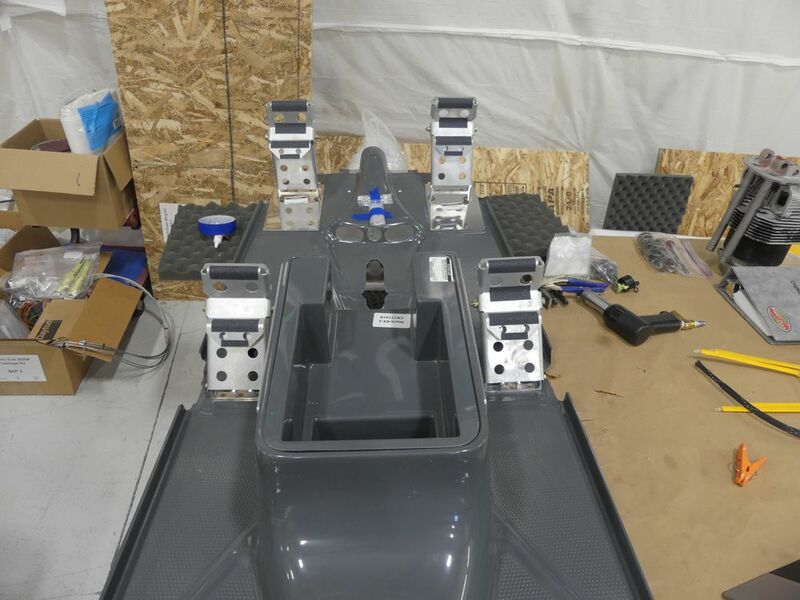 Now I have the extended baggage installed, the fuel lines are routed and loosely connected, the fuel selector is in and even the throttle/prop controls are built and mounted. Control cables are positioned and today I will lay out the floorboard configuration installing the torque tube, control sticks, pedals and some other small items. 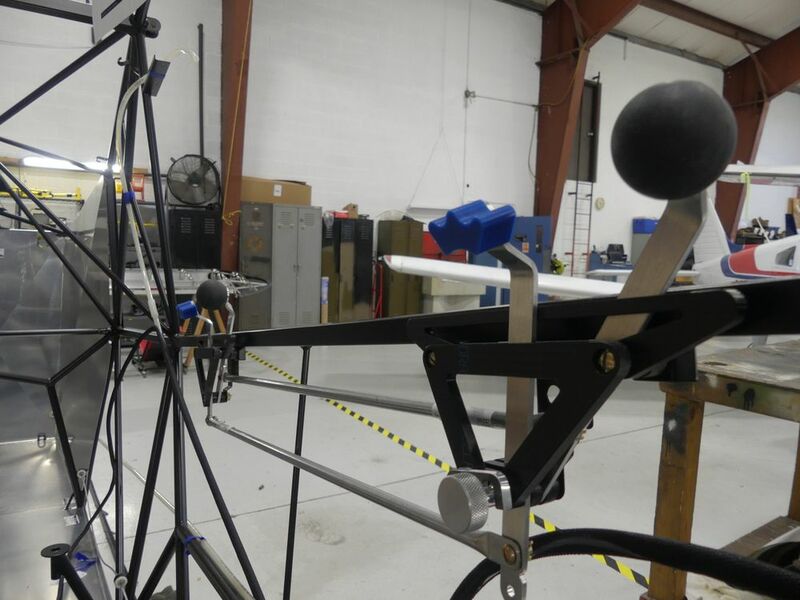 From there, I will attach the carbon fiber stringers on the sides of the fuselage, and then attack the tail section, jack screw, and motor. Hi-ho from New York’s frozen tundra. The arctic blast that spent a week in our area proved to me that Mother Nature has a plan. We have had two very sizable snow falls just recently and as I write this, we just came off of 3 +50 degree days and tonight we have freezing rain. That is winter in the Northeast. I did eke out a little flying with a couple of nice days where I went out for an hour or so and hit a few lakes and fields. Over the process of building the left wing we have learned a great deal more about self. Self is impatient. I highly recommend for all builders to give yourself an extra pause when you change operations. In my case an ever so small drill bit size change can add extra work if you miss the note to change the size. None the less, all was not lost but these are the little setbacks I have experienced as a first-time builder. 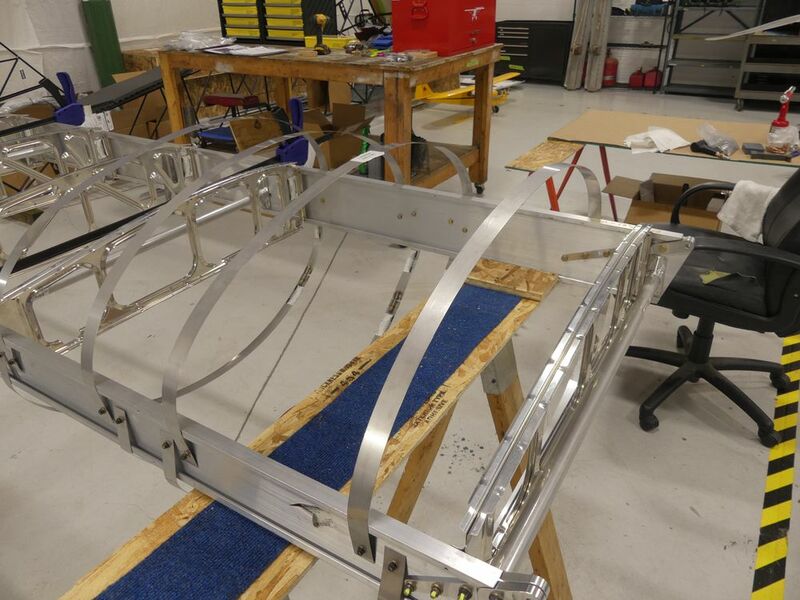 Also, I got ahead of myself in a section that asked for 4 nut plates with driven rivets to be installed on the front spar 72” from inboard. Now, I must have been on cruise control, looked at the manual, saw the parts and the drawing and the general location but totally missed the distance. There were four similar holes further outboard and that’s where I put them. Just a quick glance and boom, I did it. Not until later (read: after the leading-edge was installed) did I realize my error. Now I had to become a professional angler to fish a piece of wire through the spar and out the top of the leading-edge at one of the rib cutouts and put a nut plate on with a knot behind it and pull it through and into place. Whaaaat a TREAT! 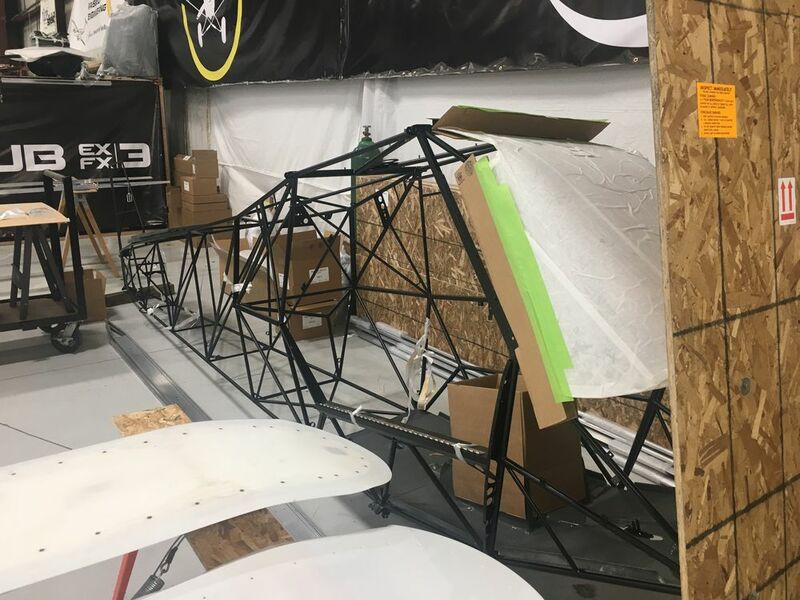 To bring you up to speed, at this point I have the trailing edge false spars for the flap and aileron both installed and all of the leading-edge is now hung and riveted in place. Here I want to stress the importance of the clamps. 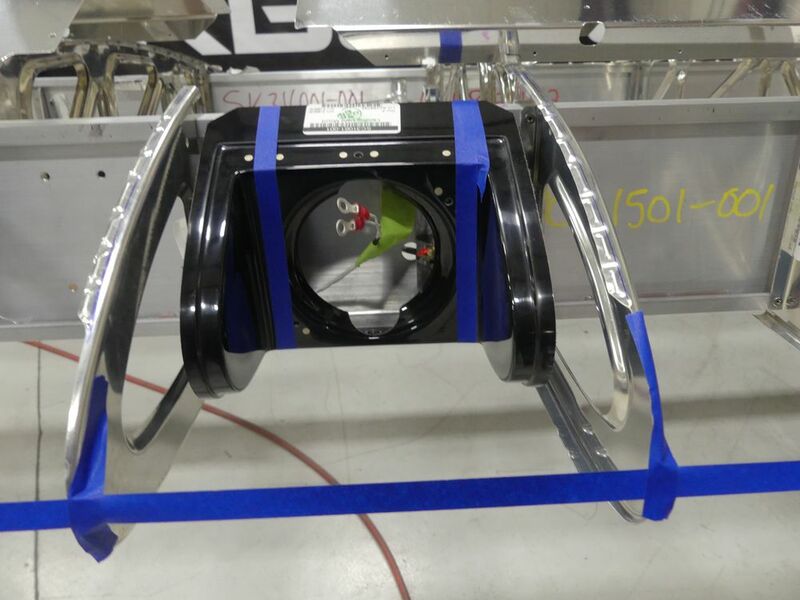 The leading edge clamps are required! They are also different than what would be used for the EX or EX-2. 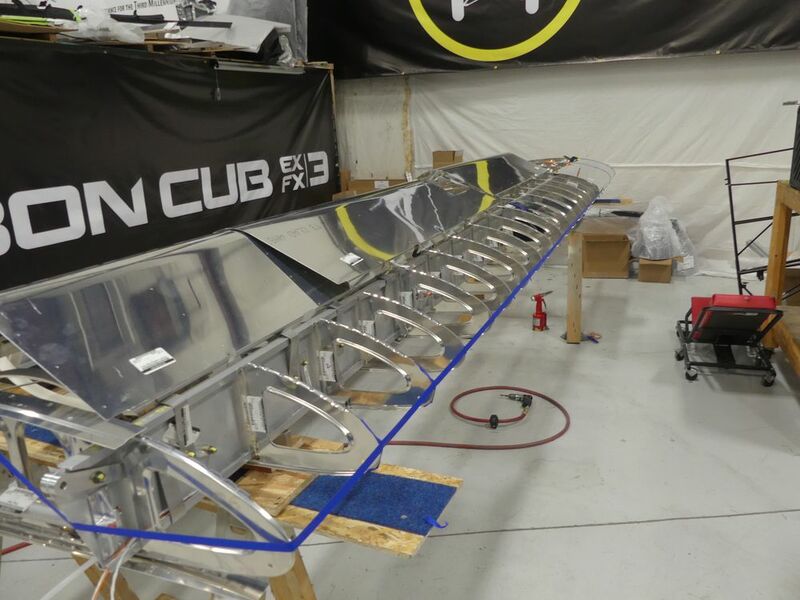 The reason they are different is because the inboard skins wrap around the whole leading-edge and have a lip that overlaps both the top and the bottom of the front spar. I borrowed a set of leading-edge clamps and will return them to the owner once completed. These clamps insure the leading-edge skin is tight against the ribs. Also, it is important to have a method whereby you keep the nose ribs in place as you start to skin. I did this using a length of masking tape but I also incorporated the long piece from an Irwin squeeze clamp. 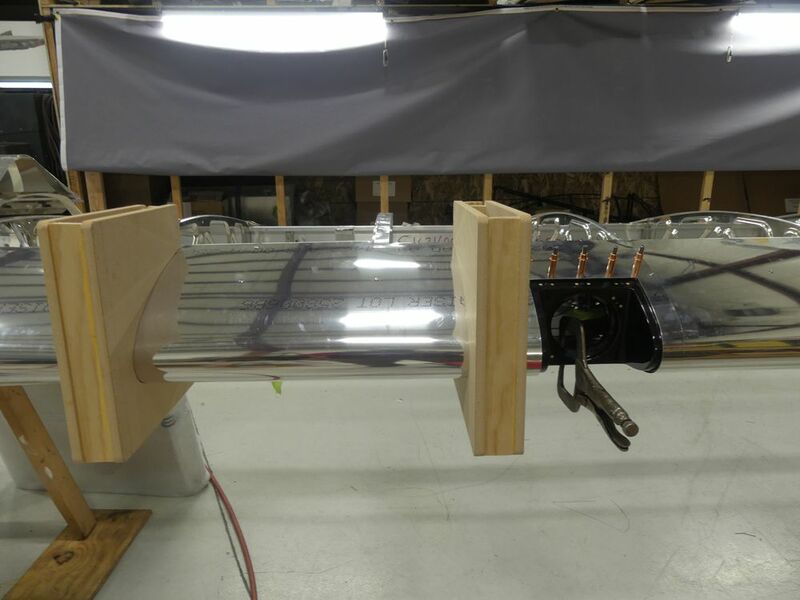 It is about 3.5’ and has the rubber clamp head on it and worked great for reaching down inside the leading edge length-wise and lining up the nose ribs on the pre-drilled holes on the leading edge. I also used a Sharpie fine-point to draw a center line on the nose rib itself that I could see through the pre-drilled holes on the leading edge skin. Once on center, I drilled and then riveted. 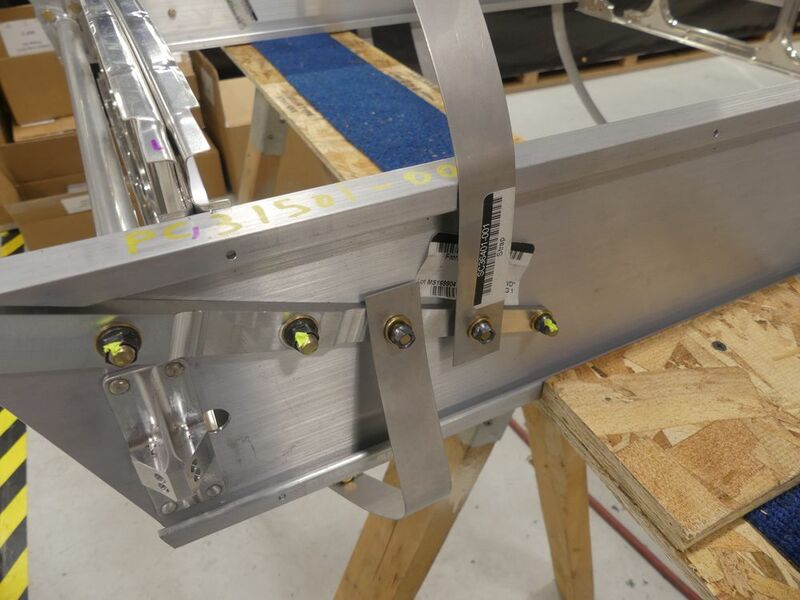 With the leading edge skin complete on the facing side, it is now time to use the drill guide (blue L Shaped piece with 2 holes in it) to attach the back side edge of the leading edge skin to both the top and bottom of the front spar. This is different from the EX-2 as there is no edge to wrap around the spar and rivet. The importance of the guide is this: it has the preset distance so you do not hit the spar bulb with the drill. Hit your spar bulb just once and your $5000 spar is junk. (Read the beginning of your wing manual and then read it again!) This might be the most critical step in wing assembly in my opinion. The guide assures your success. 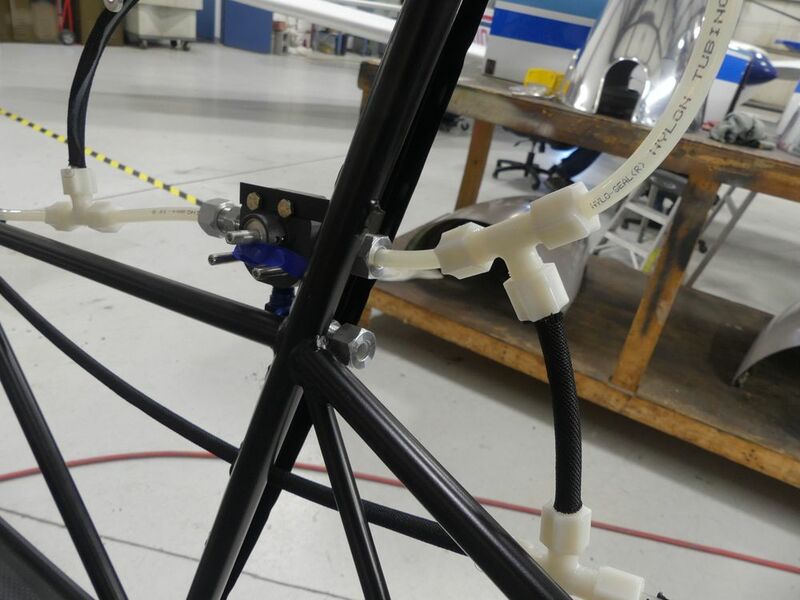 With that part is done, the pitot/ADAHRS tubes are installed and all the wires are run in the spar. This week, I will have the wing tip installed, then the fuel tank, then the pulleys and wing control cables. 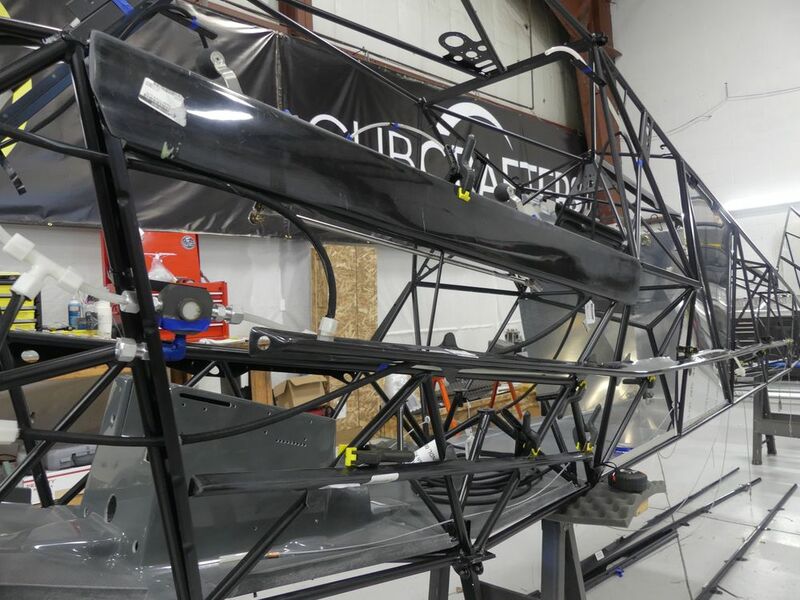 Finally, this wing will be ready for cover/paint. At this point I feel I am about a week behind schedule and hope to make up ground on the second wing. I did take a bit of time to assemble on the rudder pedals. There is still plenty to do. As part of this building project, I committed to write periodically in the blog and also suggest updates to the manual. Indeed, it is no small task. I began shortly after Thanksgiving and started on the left wing (pilots left). I would consider myself rather knowledgeable around an airport and airplanes in general. I am no A&P or IA but this build project is meant for the novice. Yes most anyone can take on this task with good discipline and organizational skills. Granted, I do work for the factory but part of this endeavor is measuring how we are doing from a supplier perspective. How are we taking care of you, our customer, after you bought one of our kits? I think things are going well so far. Like any project big or small, plans are key. Getting organized, having useful tools in place and knowing how to find things quickly is a big help. Layout is also important. A functional work space where there is not much wasted time or steps has helped me. I have not hung up the parts and pieces on boards like I’ve seen many do, but I have a pretty good visual memory, and my kits are broken out so I know where to find things. Many folks do well learning from a book or even from a proctor or a video. I learn best by doing. That said, some of these processes are new to me. Bucking rivets, as an example, is something I have done but I certainly am no expert. I suggest practicing this significantly beforehand. The left wing is well under way and I probably have another week left before it would be ready to cover. If I have had challenges, they are due to a lack of specific experience. As I said, I am mechanical but installing rivets on sheet metal for a domestic heating system is far different from counter sunk rivets on an airplane wing rib. A poorly installed rivet in the heating system vibrates and maybe creates a little annoying noise. 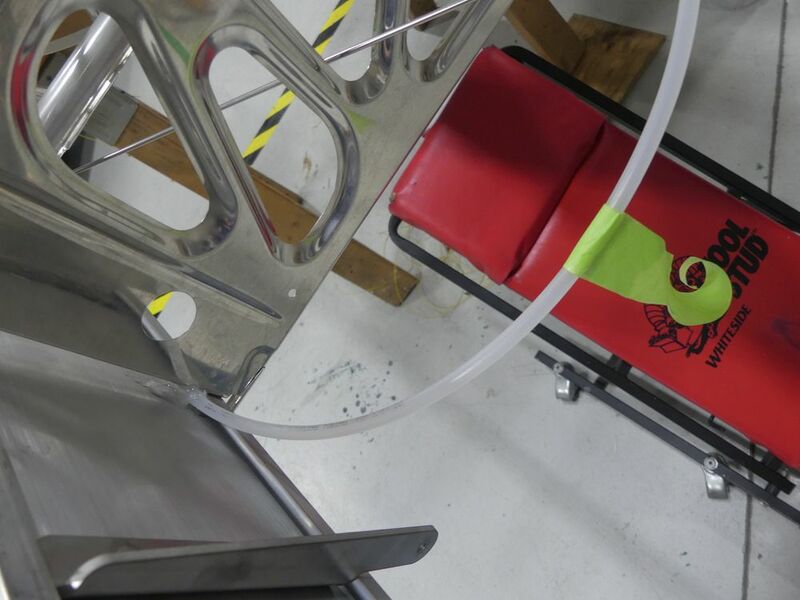 On a fabric covered airplane, it does not hold surfaces together tight, it vibrates loose and failure can occur or a sharp edge can cut thru fabric. So there is a small learning curve using tools I have never used before, but this is not brain surgery. Being “type-A” and a little high strung, I tend to shoot first and ask questions after. Yes, I have always been the guy to build the crib without the drawing, even though it’s right there in the box. Only after I get stuck or worse, break something, would I consult the directions. That will not fly here, no pun intended. It is not a great formula for building a plane you plan to fly yourself. 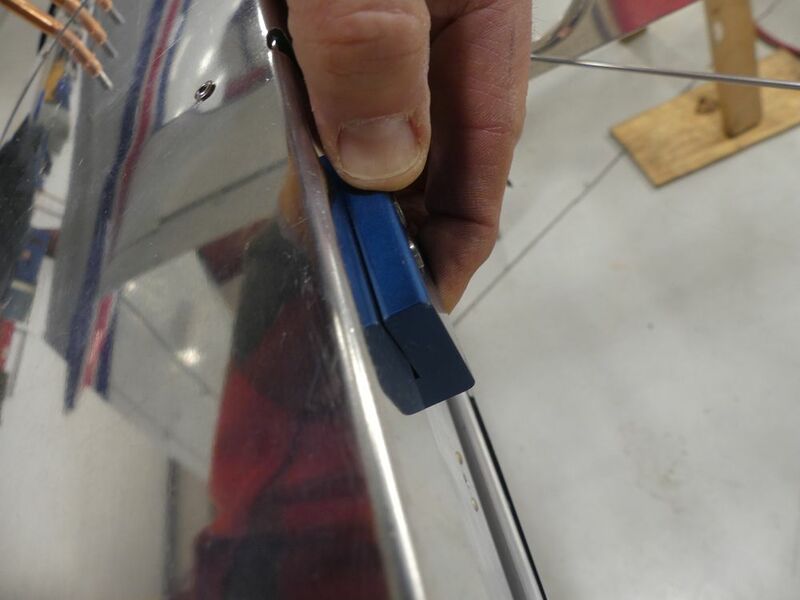 I have had a few simple instances where I did not know a proper clearance for a wing rib part near a spar bolt, as an example. How do you know this if you are not taught or do not have that practical experience? You have to keep in mind when working on this that everything moves, flexes, or vibrates. So rivets must be flush, there can be no sharp corners or edges, measurements are crucial. In building, I have had a few challenges and my biggest so far was what I hope will be a one-time mistake. It cost me dearly in time and my frustration level was pegged. It reminded me once again to park the “type-A” personality, slow down and recheck the work done. 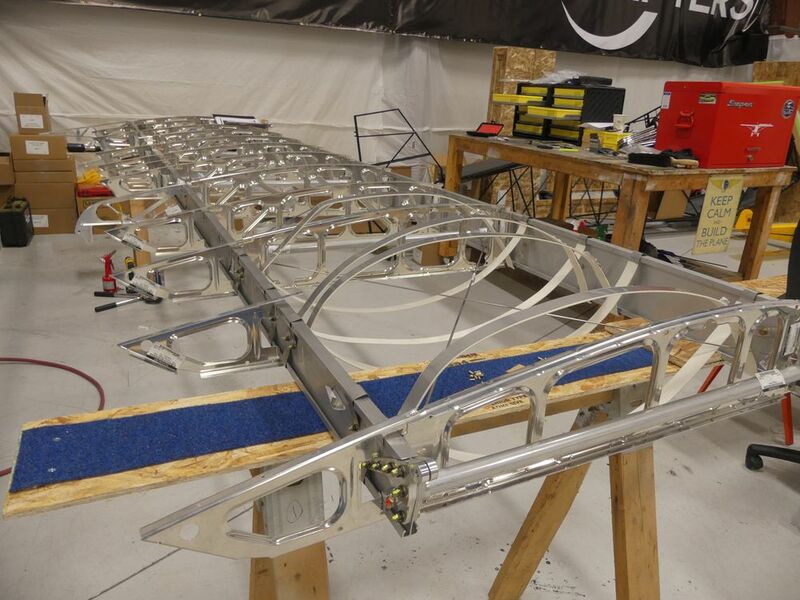 I have installed all the drag tubes and drag wires that are used to square the wing. 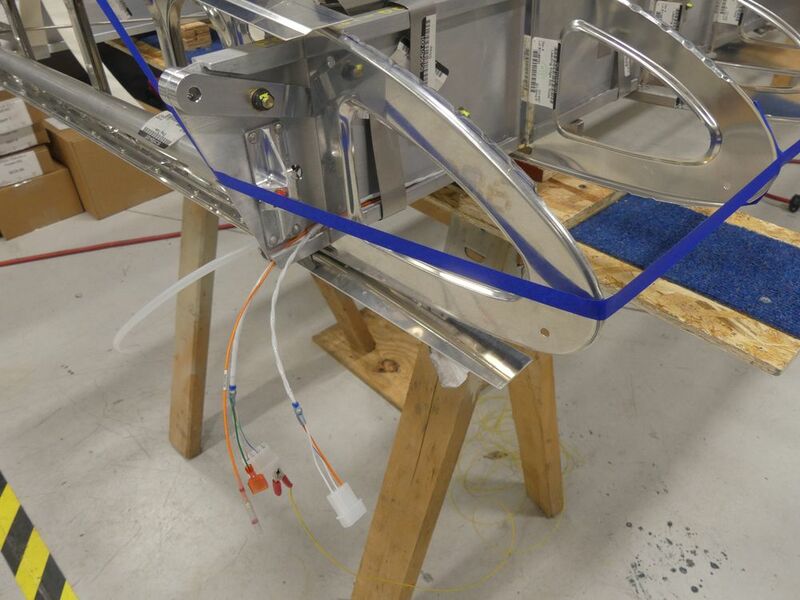 This can be challenging because it is a progressive process and you have to get the initial inboard wires set properly before working your way outboard. Yeah, I had to do it twice! 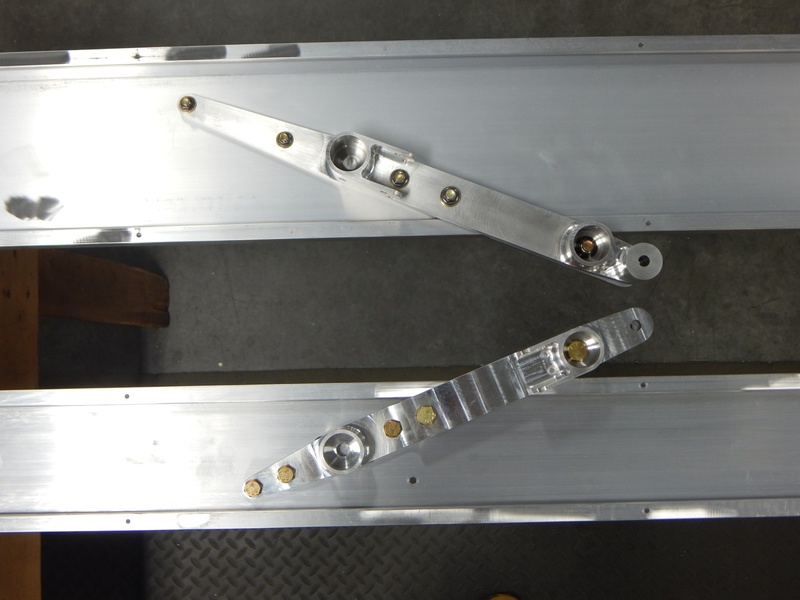 At the lift strut attach fittings on the spar, there are 3 drag tubes and one of them has the hardware inside the hollow drag tube for attaching the brackets to the spar. On that one you must tighten and torque the bolt and nut and seal it before installing the other drag tubes because one of those tubes goes over top and hides the nut. 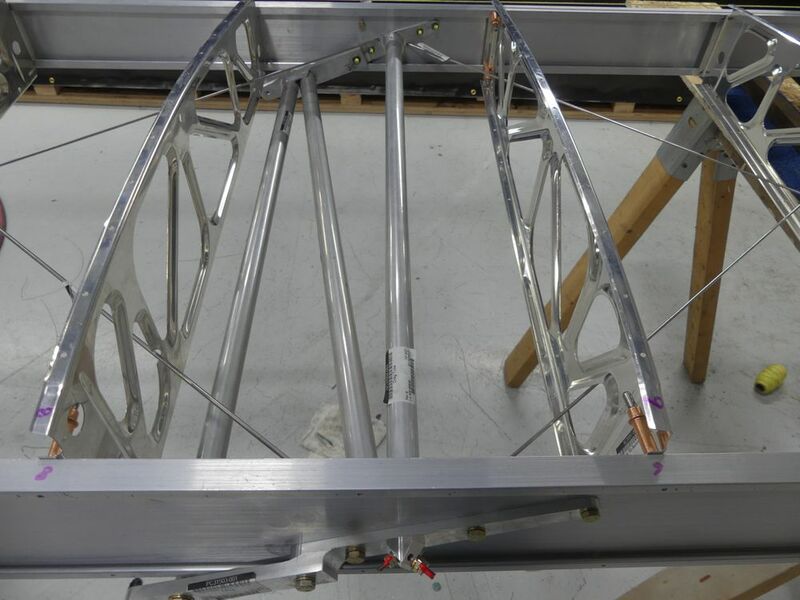 After the drag tubes get riveted you then rivet in the remaining ribs outboard and set to install the drag wires to square the wing. 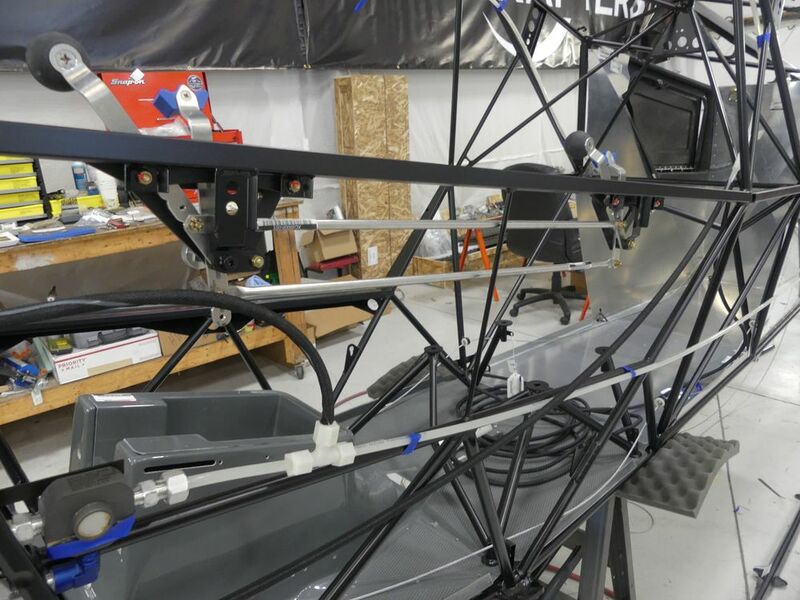 I don’t care who you are, but if you get to where the drag wires are being tightened to square the wing and you realize you forgot to torque that one bolt, you’re going to have to take a seat and think about what you forgot. I was frustrated and after an hour of looking at the situation and seeing no way to resolve it, I had to undo my work so I could go back and torque the assembly as needed. I had to eat that one and chalk it up to lack of experience. We have many resources on our website through the forum posts of our builders and our factory support team. You just cannot be in any hurry, and if you feel you are, I suggest you take a walk. Hi again from the balmy northeast. With an early snow season, the YankeeOne kit arrived by Yellow Freight the day before thanksgiving. I had some experts with a four-wheel drive loader outfitted with forks in place of the bucket to move this jumbo-size box off the truck. It was picked up from one end and hauled out of the truck to the lift gate. Once the opposite end was on the lift gate, a choreographed dance was performed with precision to lower the big box to the ground. 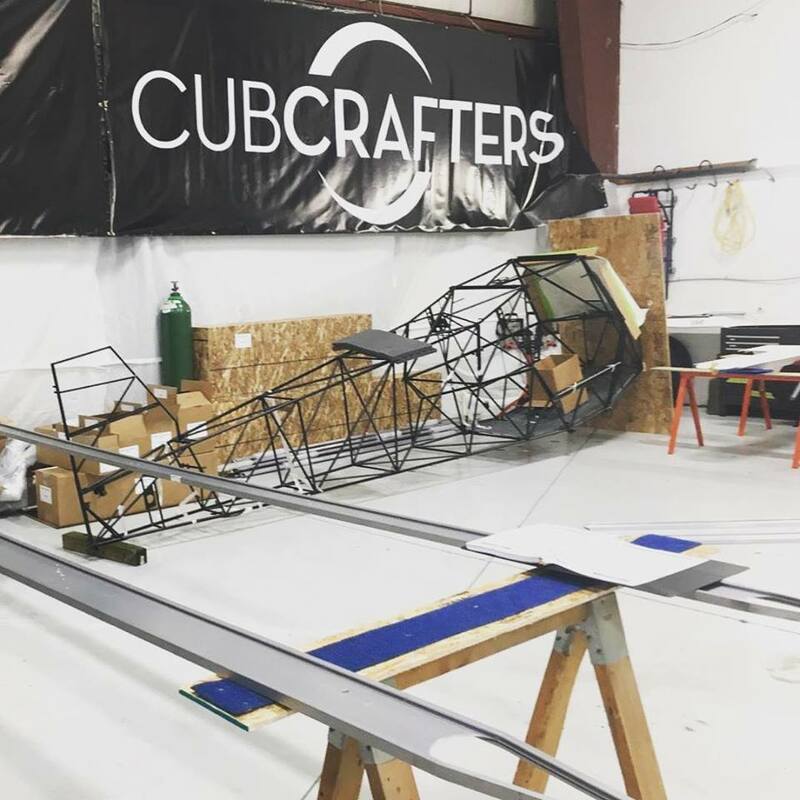 CubCrafters’ Northeast/Great Lakes HQ secured a space 45’x25’ in the back of our hangar at North American Flight Services, Saratoga County Airport. This will be our home for the next 6-8 months during the building process of our EX3, aptly named “YankeeOne”. At this point we have not chosen paint/color scheme. However, we know the scheme itself will be in concert with our schemes offered at the factory. I do not expect any Yankee pin stripes on this hot rod. Once the crate was open I quickly got to unloading it. 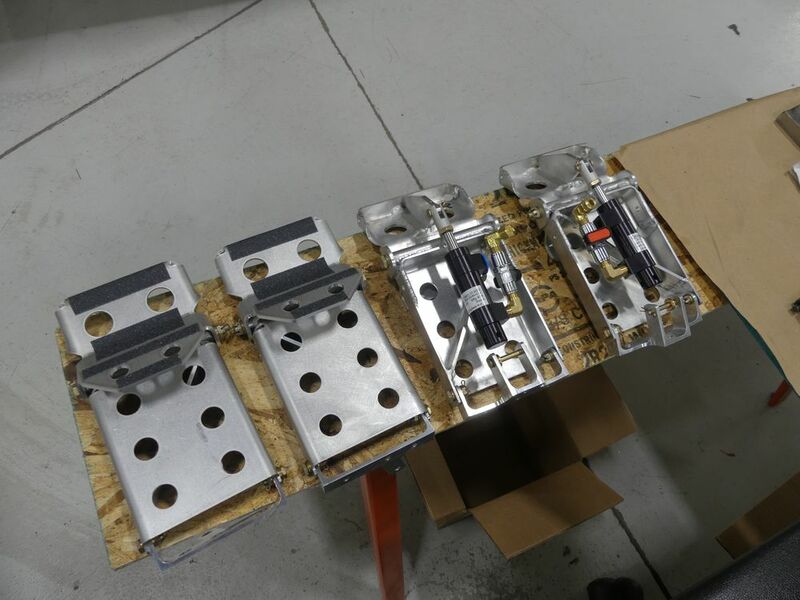 Our parts team and shipping department are consummate experts when it comes to packaging, crating, and loading. 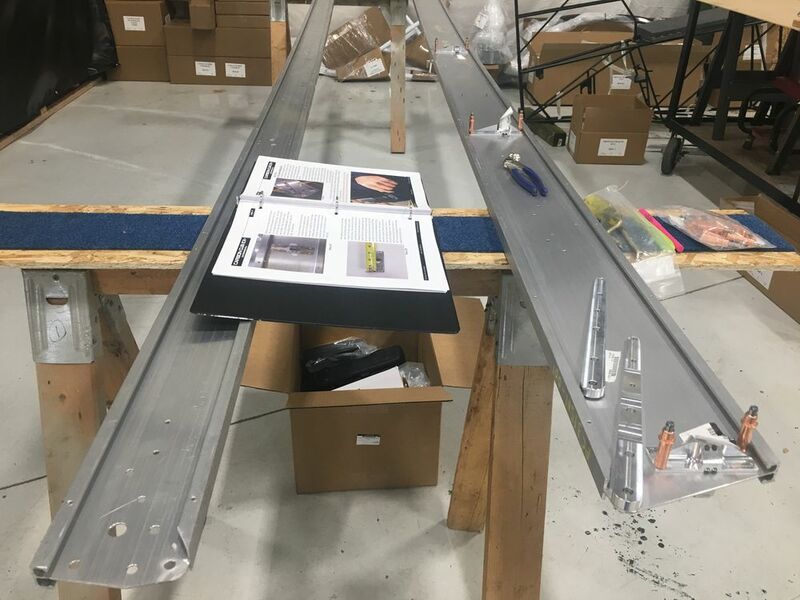 The boxes are all marked per our three basic kits (Fuselage, Wings, Finish), so when you receive your kit you can organize the wing kit parts in one area, fuselage and finish kit parts in separate areas. I suggest a large table and a chair. Get comfortable, you are going to have a few hours invested in doing your inventory of the parts. 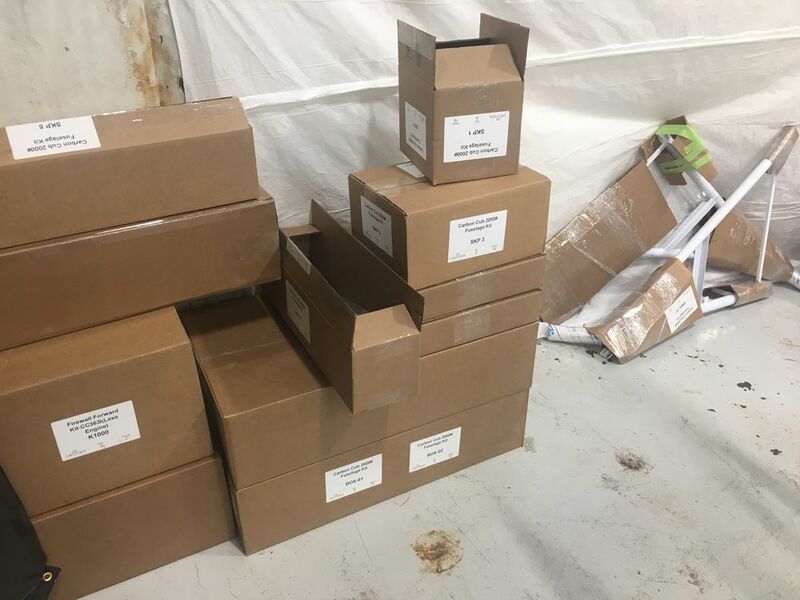 During this process I learned that you will be circling back to the boxes/parts once the inventory is finished, so I do NOT suggest mixing any parts from the kits even though you may have a process in mind for organization. The parts you need to build the wings are in the wing kit, so keep it separate. I had a little interruption during the inventory process with a ferry flight of an XCub from MN-AZ, so I lost a few days, but I think the inventory process can be done in two days by one person without interruption. It took me a tad longer. So now with the entire inventory done, I have my horses set up, the fuselage is out of the box and on the ground, and I have the right wing spars on the horses ready to assemble. Now to remember which box those brackets are in? I got it! 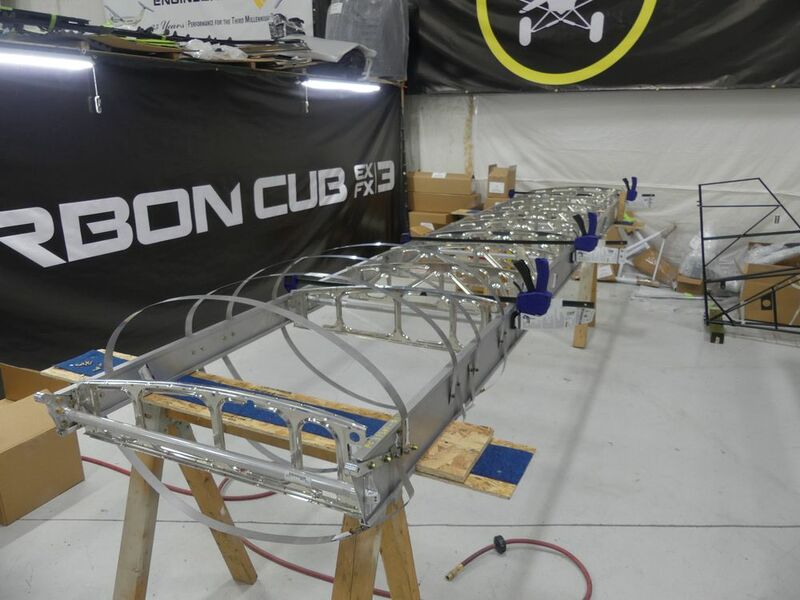 In June, 2018 I considered the possibility of building a Carbon Cub EX-3 kit. I’ve been selling these things for a few years, and though I feel like I know the airplane pretty well from a pilot’s perspective, I would like to be better able to discuss the nuts & bolts… the details of construction, with more authority and I think that building the kit would be an invaluable education, and a fun project too! As the Northeast winter approaches, I’ll have some more down time. This might be be a great opportunity to keep busy and get my hands into a kit. I am no stranger to mechanical work. I was working on small outboard motors with my dad in marinas starting at 8 years old, and other projects such as snowmobiles and cars too. After I made a proposal, the senior leadership at CubCrafters agreed this will be a worthy project. I tell prospective kit builders, “You can do it!” It’s time to prove the axiom to myself. 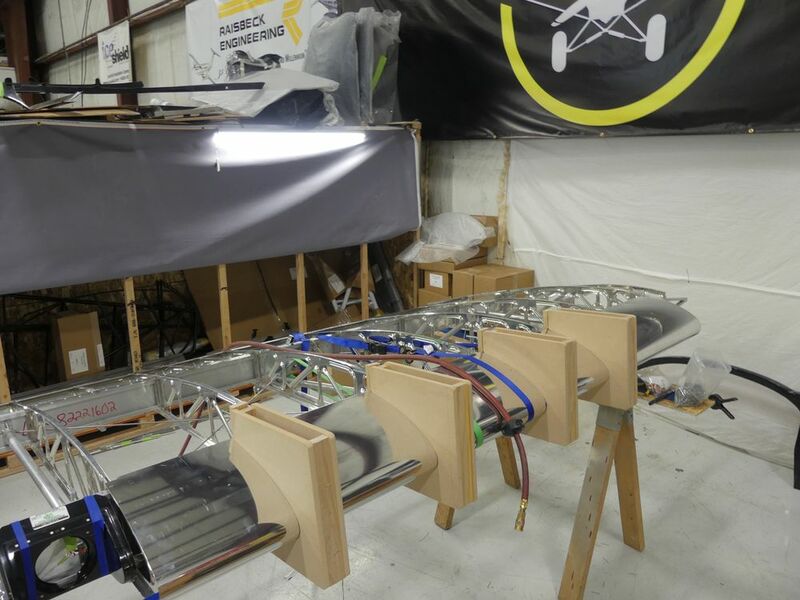 Both of the Carbon Cub EX kits are assembly projects, NOT fabrication projects. Even with modest skills, you (and I) too can build an airplane and in the process, save some pesos, bucks, dinero, geetus, Benjamins, frogskins, greenbacks, bread, clams… CASH BABY! Will it take some time? Yes. I anticipate 800-1000 man hours, but I must wrap my head around this and form a plan. Will I work 3 hours a day? 6 hours? More? Whatever it is, stick to the plan. My intent is to have this machine done and ready for my big reveal next summer. Keep in mind, this is a big commitment for me, and I’m a bit nervous about it. I’ve already ordered the kit, rented space in a local hangar, and started collecting some specialized tools and supplies for the build. I’ll refer to other builders’ logs on the CubCrafters EX Forum, like those from ceslaw and Daveembry. There is also continuing discussion on the Forum from current and past builders. Of course I’ll rely heavily on CubCrafters’ technical support guru, Mitch Travis, as well. I believe I am ready to start. Stay tuned and look for many updates here on this BLOG, the EX Forum, Facebook, and more. 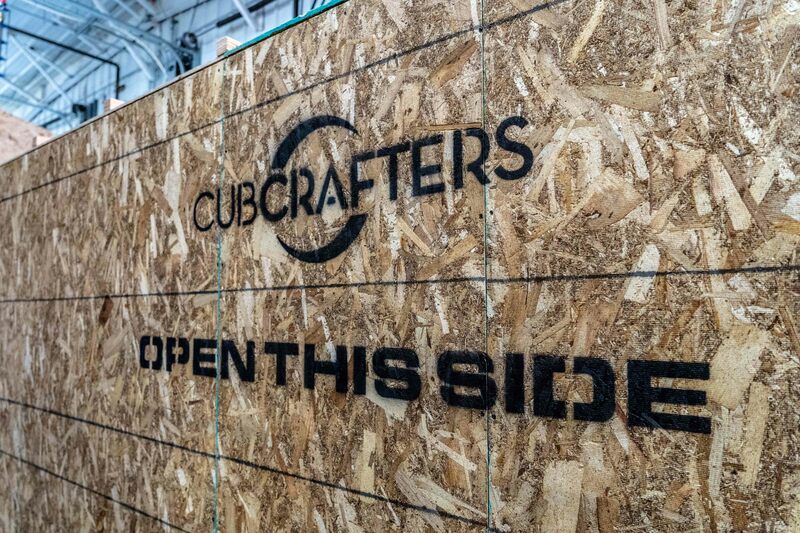 The CubCrafters team will field your questions and keep you updated. I’m excited to bring to you the play-by-play of my construction of YankeeOne! Hi Mark — Great description of the start of the build process of the EX-3. Lots of good points for other builders to consider. I’m glad you have the opportunity to do this. I’m sure you’ll do fine — hang in there and be persistent but patient moving forward. If you’re accepting internships (free help) I’d love to give you a hand and learn from you. Thanks. Am a new pilot looking to purchase my first plane.. would you please be able to tell me how much this venture is costing you and with what options if any? Yes the basic kits cost for the EX3 was $29k for each. The wing kit, fuselage kit and the finish kit. The EX2 kits are $25k each. Once you have these 3 kits then you can figure out what you want to do about your engine and panel options. We chose to use Cubcrafters engine and panel. I suggest using their configurator on there website. Click kits when on the main page and then scroll down until you see EX2 or EX3. Select one of those and then scroll a bit more and you will see “Configurator” Here you can build the plane with options you wish as well as paint scheme and it totals the value for you. You can even look at different paint schemes and color options. If I can help further, reach me here or on the forum or call cubcrafters and they have my info too. Cubcrafters needs to offer those offset pop rivet heads for pneumatic rivet pullers in their store. My hands still hurt from pulling all this wing rivets a couple years ago! However, all that aching was worth it. I want one of those tools or my next one. 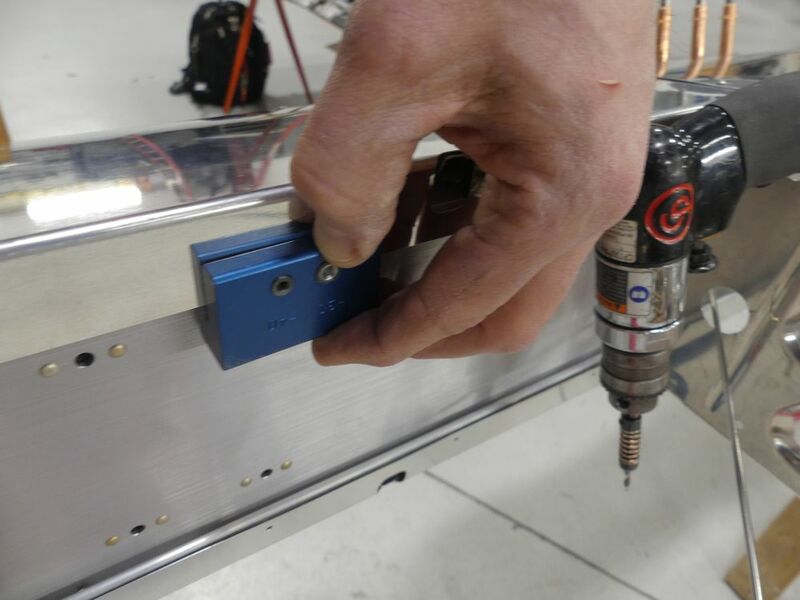 That is not an offset rivet gun, it is the one that comes in the Carbon Cub Toolkit from Cleveland Aircraft Tools.